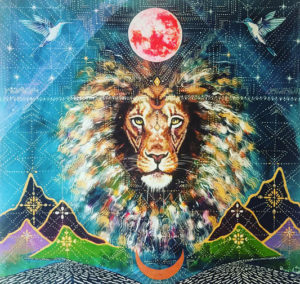 On Saturday August 11, 2018 we will be blessed with a New Moon Solar Eclipse in Leo smack dab in the middle of a retrograde dance party. Are you ready? A New Moon offers motivation to start, begin, initiate, define. Leo focuses us on our strengths, purpose, confidence, & charisma. The Solar Eclipse boosts the resonance of unfoldment into the next 6 months. The Retrograde activities encourage deep introspection & personal reflection, insisting we become familiar with our inner truths & personal power. Now is the time to make changes, to adjust your course, to renew your being, to clarify your message, to propel your self into your dreams for the future & manifest them into your reality. Energy has been building through the last month & culminates with a cosmic reboot allowing for deep soul alchemy & a crescendo of transformative healing. This weekend spend time & energy focused on what it is you want to create, on who it is you want to become, on how you want to make your mark. Visualize, journal, create a vision board, hash out your plans with your tribe or a trusted advisor, build, dream, meditate, prepare for actualization. Be mindful & careful about where & how you focus this energy, it will be much more productive aimed at something specific rather than generally or all encompassing. Refine your alignment, pick what is most relevant & submerge yourself. The energy of this Leo New Moon Solar Eclipse is available to align you with your potential & illuminate your most potent path forward.